These are actually pictures of 2 meets over the last few weeks. Ralph usually goes, and he honestly gets so caught up in what is going on that he forgets to take pictures of Claire(we have great pictures of the other girls. 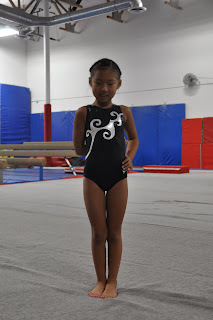 Emily's pictures were of her gym competitions. 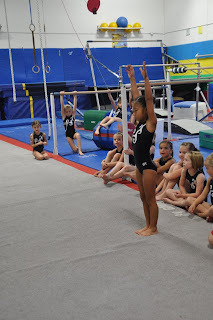 We are really proud of all 3 of our gymnastics fans. Claire has always been so graceful, flexible and calm. Emily is so strong, she is all muscle and when she gets on the mat, you know she means business. Ms Shaelee is just starting out, but she loves it, and her Coach says he is really impressed with the peanut. Claire says that Shaelee is both flexible and strong (spoken like a very proud big sister). Anyway, here are a few of our favorites. Our gym girls always make us smile. PS Emily took 3rd last night. Cheers to you Claire and Emily. Claire, you are in such great physical condition, and Emily, you both look so beautiful out there. Keep it up sweet girls.